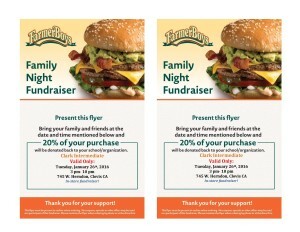 Our next Family Dinner Night fundraiser is next Tuesday January 26 at Farmer Boys on Willow and Herndon. Bring a flyer and dine any time between 3pm and closing and a portion of the proceeds come band to benefit the Clark Instrumental Music Program. Pass them out to friends, family, and work and help make this a great event!